This mod checks the IPs of the player for VPNs, proxys, or other hosting services which players use to skip IP bans. These players will be blocked using this mod. It gets the information from nastyhosts.com or iphub.info. The information is stored to prevent often requests. First you need to add vps_blocker to secure.http_mods to allow https requests. vps_kick_message = "You are using a proxy, VPN or other hosting services, please disable them to play on this server." Use /vps_wl <add or remove> <name> to allow people using VPS. The idea for the mod is taken from here but it's a complete redo of it which is more lag resistant. Last edited by Lejo on Sat Apr 06, 2019 12:43, edited 1 time in total. I feel it's unlikely somebody will go out and buy a VPN just to bypass an IP ban, but I guess if somebody is having trouble with players doing that this could be useful. I do like that you implemented a way to allow people that do use a VPN to still connect if the admin/mods know they are a good player. In the current state this is illegal when processing data from users inside the European Union. How about writing complete sentences? Linuxdirk wrote: In the current state this is illegal when processing data from users inside the European Union. IPs are considered as personal user data. Forwarding personal user data to an external service without informing the user about this and having the user consenting to this before forwarding the data is illegal according to the GDPR. Linuxdirk wrote: IPs are considered as personal user data. Forwarding personal user data to an external service without informing the user about this and having the user consenting to this before forwarding the data is illegal according to the GDPR. It starts checking on prejoin so that the player can be kicked when fully joined. If they need to accept first they can play until then. The best way would be in my opinion to add it to the registering information of 0.5 so that the checking will be done after this. Linuxdirk wrote: If they need to accept first they can play until then. [...] Do you have another idea? Maybe have a formspec that reappears on closing it until the decision was made. At bare minimum you need to fully inform the user what data will be transferred and to what service the data will be transferred and why the data will be transferred. Best would be waiting for 5.0.0 with it's better API calls for when people join so you can intercept joining. Not exactly sure how to do that though. By Connecting you accept that your IP-address might get stored to block malicious users and might get uploaded anonymous to third party websites. So you "agree" by joining the server and be informed about that after you joined the server? I am pretty sure that was illegal even before GDPR. You see the info before you join the server. It’s the server info sent by the public server list. I am by no means an expert on the GDPR, nor do I care about that law--since I'm not in the EU. However, if I am not mistaken....to be GDPR compliant (at least in part) you must give EU users the ability to request that their IP-Adress (or other information) be deleted from the server. Following some of the news coverage on the GDPR, this meant providing a portal to allow EU users to view all of the information you have collected about them. IMHO, the GDPR is a prime example of government-overreach, simply because the EU is trying to force that law on the rest of the world rather than just companies operating within the EU. For instance a US company could be held financialy and legally liable for any mishandling of an EU citizen's public/private information. The problem with this is it practically gives the EU unlimited-power to force a law onto people/companies that shouldn't be subject to EU-law. To further expand on the absurdness of the GDPR....what happens if someone's router happens to log or otherwise retain an ip-address of an EU citizen ? According to the site I linked to, the collection ip-addresses is considered "personal information," so would that router and its owner (not being a company) be subject to the GDPR ? The simplest solution to the problem (to avoid the GDPR all-together) would be to block access from anyone in the EU, but that has its own set of problems. neoh4x0r wrote: I am by no means an expert on the GDPR, nor do I care about that law--since I'm not in the EU. and it is running for the people from this law area, like me, as I am German even I live not in that area. But as you can easy see on websites, they are not inside EU and not from EU people, they don't care about "our" EU laws. * maybe on hole minetest as mainly offered on an EU webpage ? when someone start to complain to a court. Actually the EU is enforcing the law outside of the EU....which is the main problem with it. The EU is using the law to protect its citizens by forcing everyone else to abide by it (even if not in the EU). The GDPR not only applies to organisations located within the EU but also applies to organisations located outside of the EU if they offer goods or services to, or monitor the behaviour of, EU data subjects. It applies to all companies processing and holding the personal data of data subjects residing in the European Union, regardless of the company’s location. Last edited by neoh4x0r on Fri Mar 22, 2019 05:33, edited 2 times in total. neoh4x0r wrote: Actually the EU is enforcing the law outside of the EU....which is the main problem with it. It doesn't have to be a company located in the EU to be subject to the law (the only requirement is that they interact with EU citizens) . PS: I don't understand what the English or German language (or server name) has to do with a legal law in the European Union (and who is or is not subject to said law). neoh4x0r wrote: It doesn't have to be a company located in the EU to be subject to the law (the only requirement is that they interact with EU citizens) . You just wrote yourself: "they interact with EU citizens", so when a server is special for German gamer, as maybe thought about a GE language server, this server and his owner, is/are interacting with EU citizens, and so might have/get the same problems. Lejo wrote: You see the info before you join the server. So you see it before and after joining? Because there are ingame clouds in the background of the text. That's why I'm wondering. Only Before but this should be enough. We disconnect players with the question to reconnect and the indo as disconnecting reason. So they player accepts by reconnecting to the server. But this needs a core change I need to request. Now what you said makes more sense....and it is something I already stated. It mentions "organizations that offer goods or services to, or monitor the behaviour of, EU data subjects". "companies processing and holding the personal data of data subjects residing in the EU, regardless of location". The problem is that the regulation doesn't define what an organization is, nor does it define what exactly a good or service is or what is meant by monitoring behavior (that is its meaning under the law). However, to be compliant servers would only need to inform users of the data being collected and by joining the server they are "opting-in" and also giving the users the right to view any and all collected information as well giving them the ability to delete it or request it to be deleted. is it needed to forward private address areas ? This one: wikipedia or luck other services that my be more involved. 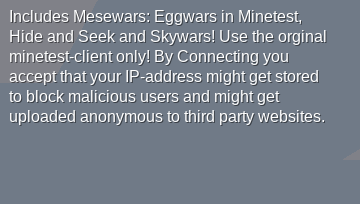 Ok, to join from private (own IP) is most not often, but still a useless check, as they are limited. Maybe drop the check if like those. An used proxy main VPN IP address has no problem with EU data, as this is not his/her private, more a public and this services ARE set up for this - getting false answer. And further is the IP stored then either in the mod after checked ? If so, that should be done different then, drop the last octet. Festus1965 wrote: ..., but still a useless check, as they are limited. Nastyhosts has pretty much false answers but iphub works perfect. Yes it must be cached Because the check starts on prejoin and while joining the client can't get kicked and when the player fully joined it gets kicked etc.. The second reason why I cache the ips is to prevent checking multiple times for one client. What about hashing the ip and just checking with the hash? Then it should be EU-OK.
PS1:I know Sha1 is insecure but we aren't sharing out bank datas so this should be ok.
PS2: Same for ban mods? PS3: I know you can brute force all ips on the world in a short time. But it's better than nothing. Nathan.S wrote: I feel it's unlikely somebody will go out and buy a VPN just to bypass an IP ban, but I guess if somebody is having trouble with players doing that this could be useful. I do like that you implemented a way to allow people that do use a VPN to still connect if the admin/mods know they are a good player. in the middle of the road was a stone. in the life of my so tired eyes.